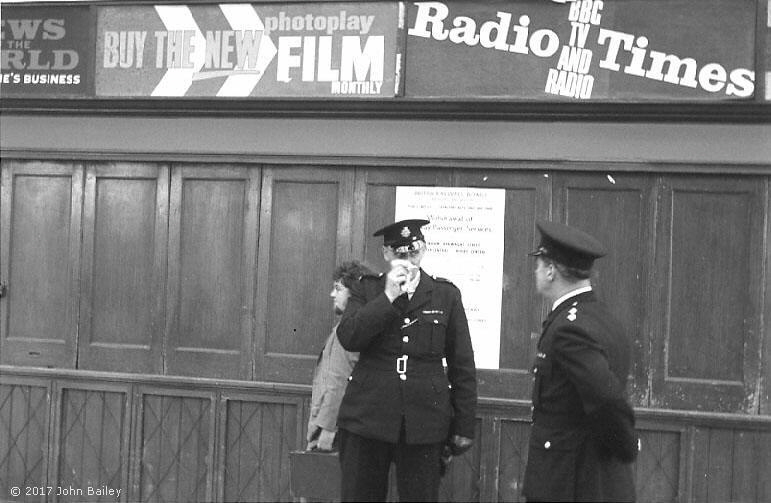 The fascinating photographs in this section have been generously provided by John Bailey. John visited Leicester Central to witness the trains on the last day of the Nottingham-Rugby passenger shuttle service on 3rd May 1969. He also visited subsequently and took photographs during the demolition of Leicester Central. The sad sight of the last Rugby Central to Nottingham Arkwright Street train before departure from Leicester Central on 3rd May 1969. The final train was a sad occasion for all who were at Leicester Central. 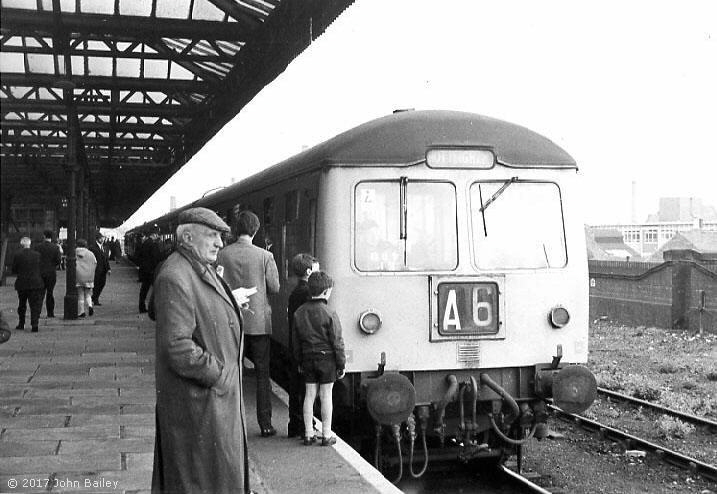 On 27/3/1970, after the last passenger train had run to Leicester Central, John Bailey and friends had a permit to walk the line. Below are some of the photographs that John took. Looking south across Northgate Street bridge towards the now disused Leicester Central station, on 27/3/1970. Looking south adjacent to the platform end on 27/3/1970, after the closure to passenger trains, showing the effect of the track rationalisation. 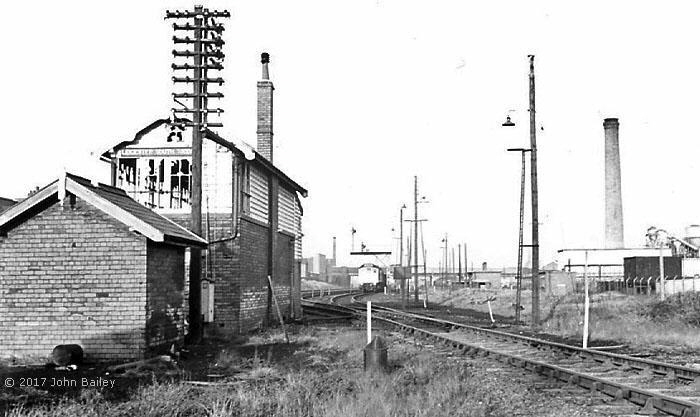 Looking north at the very derelict looking Leicester South Goods signal box on 27/03/70. In the distance, towards Upprton Road bridge, is a class 25 Bo-Bo locomotive which will be dealing with traffic for the remaining goods sidings alongside Western Boulevard. 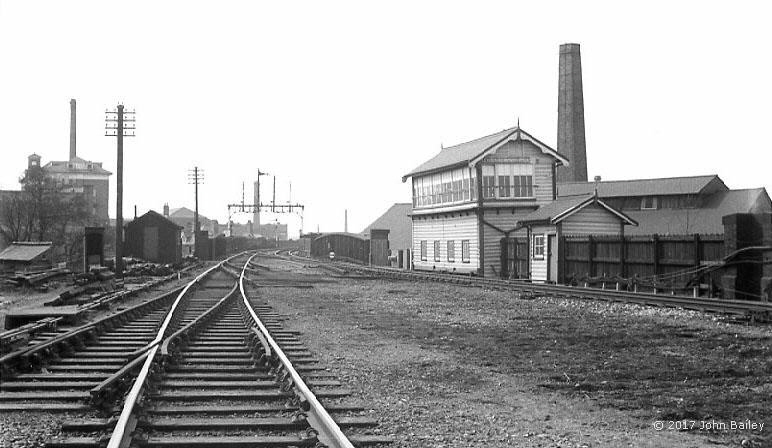 The locomotive is likely to have reached these lines via the track leading off in the right foreground to a chord off the ex-Midland Leicester to Burton line. 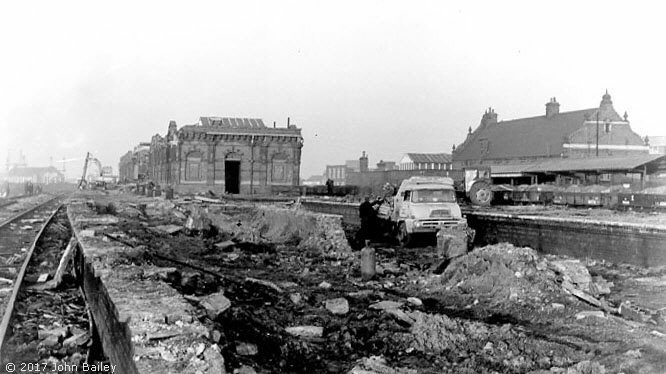 In January 1971, demolition at Leicester Central is well under way in this scene, looking north with the remains of platform 5 in the foreground. The contractor’s lorry stands on the bed of the tracks in the south bay, while the wagons of a train to carry away the spoil stands in platform 6, on the old southbound main line. 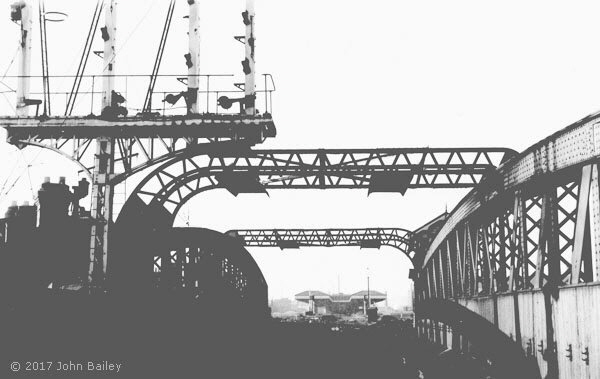 Demolition of the main station building, in January 1971, looking north from the east side. The trackbed in the foreground has been made over to car parking, while the train to carry away the spoil stands at the platform on the old southbound main line. The building on the left has pulleys on top so is likely to be for the goods lift. All photographs on this page are courtesy of John Bailey.